If you like that liquorice/aniseed flavour you should like this. 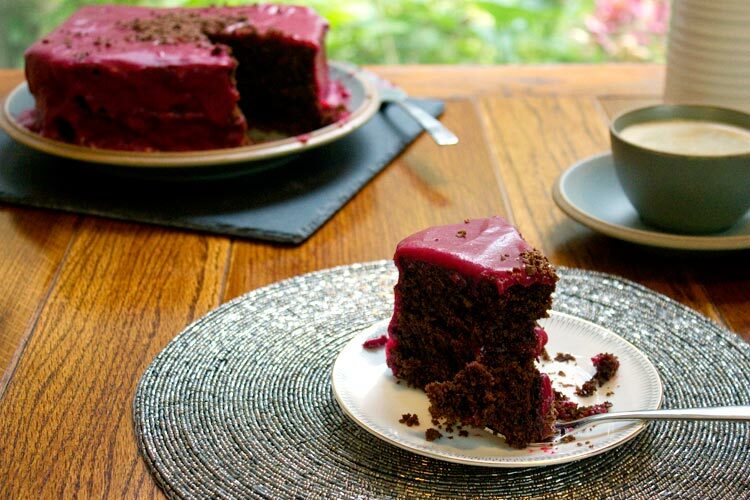 It’s very rich and has the texture of gingerbread, The raspberry ganache is also very full on flavour. And they are both also packed with butter – definitely a diet-be-damned recipe. Hope you like it. Mm cake… liquorice cake… What? Why are you making that face? So a new recipe for twimii. 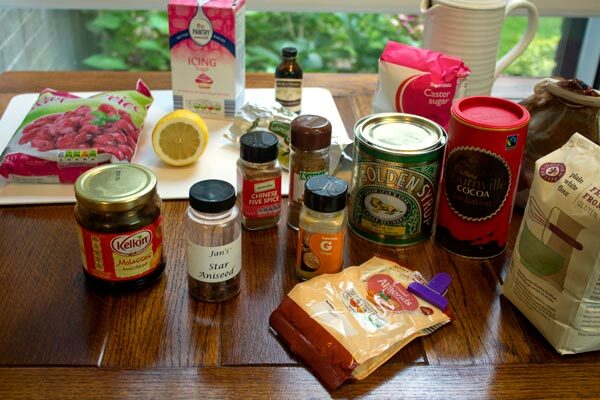 Built on an old one, the Bloody Mess Cake – but adapted and corrected to be gluten-free. Still packed full of sugar and butter. 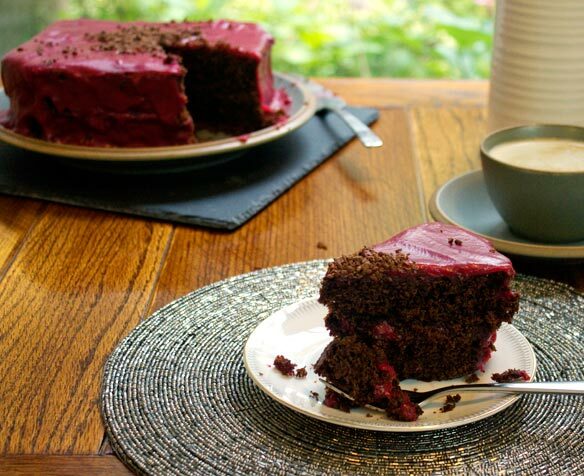 Definitely a diet-be-damned recipe, and very strong and, for some people, strange flavour from this cake, so this one is definitely not for everyone. To be honest, most people do like the Bitter Toffee Pie but a liquorice cake? – definitely not for everyone. This one looks a bit of a mess too I guess but if you’re more careful with spreading on the ganache and add nicer decorations I guess it could look better. The cake layers look just like dark gingerbread. And they taste like liquorice flavoured gingerbread. To get this taste I left some star aniseed to infuse in 125ml of strong coffee and I also added 2 tablespoons of Chinese Five Spice (wonder where I got that idea?). Stick a star on it and it’s done. The dark red colour of the raspberry ganache, that actually isn’t to do with any lighting or photoshopping, and the bright red of the raspberry ganache in the Bloody Mess Cake also was the real colour of that ganache, they both use pretty much the same ingredients so I was surprised that this ganache was so much darker. I know I used fresh raspberries so maybe they were lighter in colour than the frozen ones I used here. I don’t know what else might account for it. Anyway, this has a quite intense flavour, almost tastes like cherries – I know that sounds weird – it just tastes like that with the cake – I think it’s the interaction of the different flavours – I like it. If you want to make it less intense you could add more butter or perhaps some cream? The quantities here make a 9″ round cake. I sliced off a bit of one of the cakes to see if it tasted right, it did so then I sliced off a bit of the other cake to even it up. Then there was a flat side to the circle of cake so I tried slicing off bits around it to give it some proper kind of shape. And on I went. So that’s why it’s the shape it is. More ingredients than you can shake a stick at. – I took the photo after I had the cake made, but I was writing them down as I went along. Grease two 9 inch cake tins and line with greased baking paper. Turn on the oven to 160 C.
To 125ml of hot strong coffee add a few star aniseed. Add the butter to a saucepan and melt on a gentle heat. Stir in the spices, the molasses and golden syrup. Keeps mixing until they are well combined. Then remove from the heat. Sift the white flour and cocoa into a deep bowl and combine with ground almonds until well mixed. In another bowl beat the eggs together with the brown and white sugar. Add the coffee, through a strainer, into the melted butter and molasses mix, stir in well and then whisk this into the eggs. Then mix this into the flour mix. I use an electric whisk and it takes a few minutes to make sure it's all well combined and there are no pockets of dry flour left. If the mix looks a little dry add in a little water. Finally mix in the water-bread soda mix and stir in well. Pour half the mixture into each cake tin. Be sure to leave good room for the cake to rise. Bake for 40 minutes or until they mixture is solid and when you stick a knife into the cake it comes out clean. Take the cakes out of the oven when done and leave them to cool either on a plate or wire tray (they'll be more moist if you leave them to cool on a plate. Put the raspberries in a pan on a gentle-medium heat. Break up the raspberries with a spoon or masher (I used a masher). When the raspberries have broken down to a loose seedy mix, turn off the heat, put a fine mesh sieve over another saucepan and pour the raspberry mix into the sieve, force as much of the raspberry juice through the sieve as you can. When you have separated most of the raspberry juice from the seeds, remove the sieve from the pan and discard the seeds. 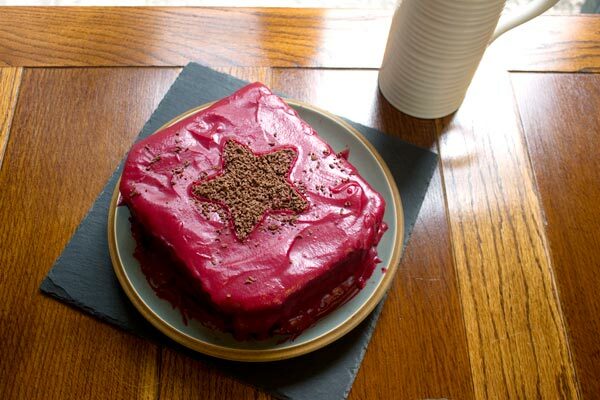 Put the pan with the raspberry juice on a medium heat and add 200g of icing sugar. Stir it in well. Keep stirring until the sauce has thickened. I think I was stirring for about 10 minutes. Add in a few drops of vanilla essence. You might find that you are happy with the taste as is or you might want to add more sugar. I added in some lemon juice at this point and I thought it refreshed the raspberry taste. If you are happy with the taste and if the consistency of the juice is now light-medium syrup like, now add in the butter and keep stirring until it is all well combined. Then remove from the heat, transfer to bowl and allow to cool until it has the consistency of room temperature butter then you can spread it on the cake. Put one of the cakes on a plate, spread over a layer of the ganache, top with the other cake and then spread the fondant over the whole cake. This is a very rich cake, very full on flavour, so a little goes a long way, be sure to cut thin slices. And enjoy! 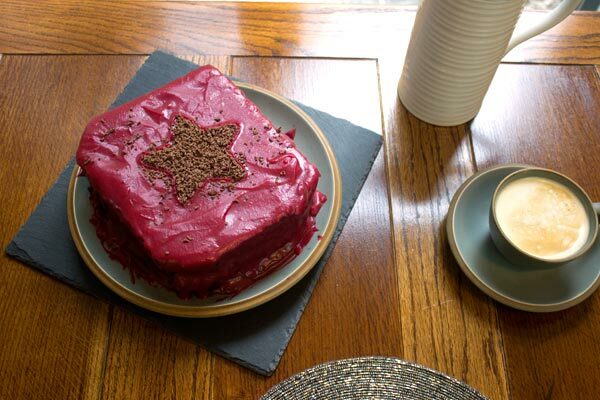 If the thought of a liquorice cake with a truly tangy raspberry ganache appeals to you then this is the cake for you. By the way this freezes well and thaws out to taste totally fresh. I love this!